Does your insurance agency website not rank well? It might be an algorithm penalty. Many new customers come to us because they’re frustrated with their insurance agency websites and not being successful in getting that site to rank well in the search engines. What many other search engine optimization (SEO) companies can’t figure out is what they’re doing wrong. Something that many don’t consider is that it may be the result of an algorithm penalty being assessed by the search engines for many different reasons. Search engines use algorithms to determine rankings within their search tools. 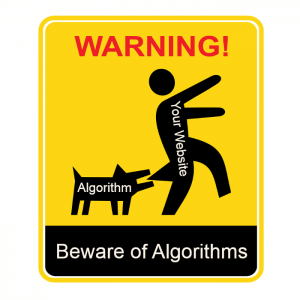 These algorithms are essentially all aspects of your website combined to give your site a score and nobody but Google, Yahoo and Bing know the algorithms codes. Search engine optimization companies like ours do our best to make websites that appeal to certain aspects that we’re confident they will like and avoid techniques known as “black hat” SEO that would create a penalty and cause the sites to not rank, or not rank on page one. While nobody can guarantee placement, we do our best to get your sites to rank on page one for targeted keywords. Unrelated Keywords – Don’t add keywords to your insurance agency website in an effort to get additional website traffic. “Collision insurance is Nikon D3200 camera meant to protect your vehicle from …” Clearly a Nikon D3200 is a silly example, but you get the point. Stick to good content. Purchased Links – Link farms are the #1 reason sites we manage are penalized. In the past the agency worked with another company who purchased links on “Link farms.” The screenshot to the right is an example of what a link farm looks like. They are often crammed keywords into the sidebar or footer with a link to your site with specific anchor text. This looks incredibly spammy to the search engines and will penalize you. We once had a customer with over 14,000 links like this! Hidden Text – Adding keywords to a website page then making the font white on a white background so you can stuff keywords into the site is not going to help your efforts. These are the three most common mistakes we see insurance agency companies make on their sites. Algorithm penalties are created by just that… an algorithm from a computer system. Once you’re able to fix these mistakes on your site, it is likely that your site will recover. Remember, the search engines love good, unique, fresh content. If they feel that your website is full of SPAM or other black hat SEO techniques, you’ll likely be penalized.